Shop online to obtain best prices for these new products. 2. Hitachi requires Mac users to reformat their new drives immediately. Hitachi recommends standard Mac OS Extended (Journaled) formatting, which is well documented on the Internet. Seagate’s Mac Installer process can be a little confusing to non-geek mortals (see comment in italics below). Seagate has tech support staff available to assist, if necessary. 3. Standard Mac backup methods, including Time Machine, Carbon Copy Cloner, and Super Duper, are possible with both companies’ drives. Seagate doesn’t care what you use to backup your Mac (or PC, since Turbo is cross-platform), in spite of mentioning automatic backup with their software, on the product’s web site. 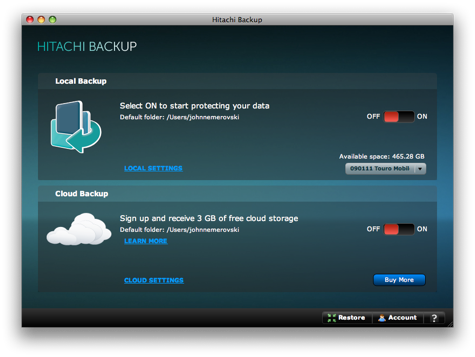 Hitachi provides backup software called Hitachi Backup. MyMac does not recommend any hard drive manufacturer’s proprietary backup software, for many reasons not being covered in this Nemo Memo. 4. You must not partition Seagate’s GoFlex Turbo. Seagate requires people to use specific formatting to assist with data retrieval, which is a major feature. You can partition Hitachi’s Touro. Partitioning is not for everyone. If you don’t understand partitioning, it probably isn’t important to you anyway. Touro and Turbo are similar in size, shape, appearance, and performance. (See speed test results below.) Touro mounts on a Mac slightly quicker than does Turbo. Both units are sturdy in construction and compact in design. There is no deal breaker difference between them for routine backups and archiving. If you live and die by the Mac OS Extended (Journaled) format, Hitachi’s Touro is your choice. If you are more flexible about drive filesystems, or you have both a Mac and a Windows PC, Seagate’s Turbo is your choice. 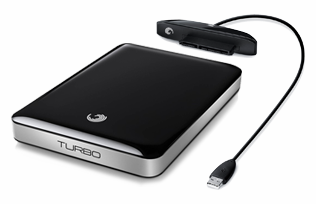 Touro is slightly less expensive, but the Seagate Turbo has a huge extra feature. Seagate’s SafetyNet recovery service guarantees that once within two years of purchase the company will retrieve lost or corrupted data, either over the phone or via mail-in, as appropriate. The slight premium in the price of Turbo over Touro includes SafetyNet, which is very cheap insurance when you need to claim it. See DriveSavers‘ pricing structure for an example of how expensive commercial data recovery can be. Hitachi provides “3GB of cloud storage” that I did not try. I don’t have enthusiasm for most cloud storage methods, although I am willing to keep investigating. Touro’s hardware guarantee is also two years, without any data retrieval service. I think that users looking to backup their data are lucky in that there are a wide array of options available for doing so. Personally, I tend to stick with whatever software (free or otherwise) came with my device, but I can certainly appreciate the diverse amount of cloud options available to consumers. Hitachi’s stance is that it’s proud to offer its users a simple solution for safe-guarding, accessing, and sharing digital content from as many computers as they like with HitachBackup.com. Users who purchase the Touro Mobile Pro get 3GB of free storage space in the cloud and have the option to upgrade to Hitachi’s 250GB storage limit for an extremely competitive annual price. 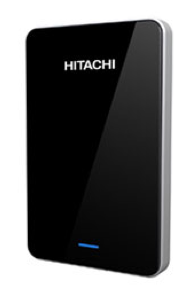 While users can back up their Hitachi hard drives in a variety of different manners, the cloud storage options available through HitachiBackup.com offer a straightforward method for them to access their data from devices ranging from their personal laptops to an iPod with a Wi-Fi connection. This is a first look Nemo Memo, not a review. These affordable external USB units are new products. MyMac will continue to use and report on them, when appropriate. My transfer and archiving experiences so far have been positive. I have used Seagate’s USA phone tech support, with reasonable success, but I have not contacted Hitachi tech support to date for any reason. Comparison 1 data transfer speed test: 13.24 GB iPhoto Library. Results: 25 minutes using Seagate Turbo, and 29 minutes using Hitachi Touro Mobile Pro. Results: 6 minutes using Seagate Turbo, and 7 minutes using Hitachi Touro Mobile Pro.